And these aren’t the only stories to come from Grand Lake St. Marys. Indeed, hundreds of thousands of people have their own Grand Lake St. Marys stories, a few of whom have recorded some of the lake’s historical highlights – and lowlights – for us to enjoy today. Much of the lakes’s past has undoubtedly been lost to time, but there remain a few stories grand enough to retell here. How many of them do you know? Click here to visit our Grand Lake St. Marys History Photo Gallery! 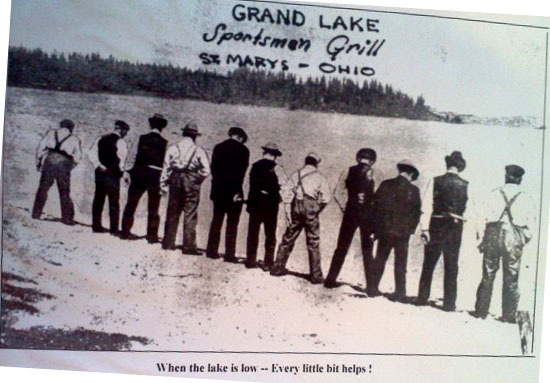 Click here for the full history of Grand Lake St. Marys! 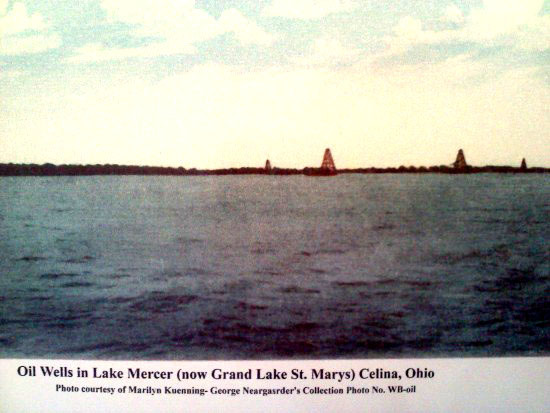 Click here for more history and a map of the oil derricks in and around Grand Lake St. Marys! A terrible trifecta. Sadly, Gordon State Park suffered two fires that burned down the dance hall and Devil’s Backbone. No cause was ever found for the first, and the second fire burned down a smaller, second dance hall built after the first burned down. Add to the fires a devastating tornado and the Great Depression, and Gordon State Park ceased to exist in 1933. 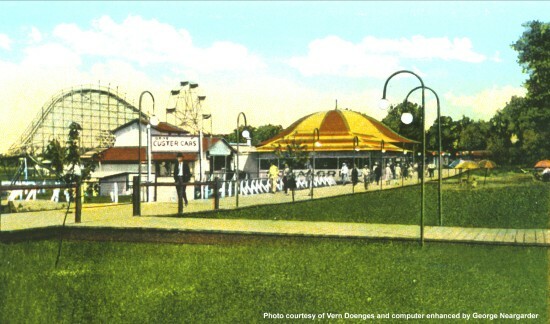 Stil, the once-thriving amusement park demonstrates what could be done with a little land, a great attraction, and some savvy marketing. Click here for the full history of Gordon State Park! St. Marys nearly wiped from the map! As you’ll recall, many were proponents of returning the lake to farmland. Newspaper accounts at the time surmised that the dynamiters were trying to do just that after the state passed legislation to reinforce the banks and retain Grand Lake St. Marys. 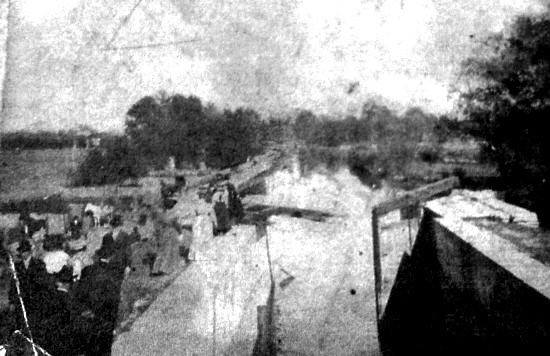 Interestingly, it was believed that the plotters had targeted the bulkhead so that the water would flow down the feeder channel, into the canal, and ultimately into the St. Marys River – sparing St. Marys from devastating flooding. Had they tunneled into the East Bank and sparked the dynamite there, it was stated that St. Marys would have been wiped from the map. Had they placed the dynamite down between the gate posts, the plan might have succeeded. Instead they placed the dynamite on top of the stone walls. Blast felt nine miles away. Shockwaves from the blast traveled nine miles through the water and rattled Celina, but was not felt one mile away in St. Marys. On the east side of the lake, only the closest to the blast felt and heard it – and it even wrecked a two-story house located just 50 yards away. Incredibly, the family within survived. State investigation failed. Despite the state’s vow to hunt down and capture the perpetrators, no one was ever indicted for the crime. What’s in a name? 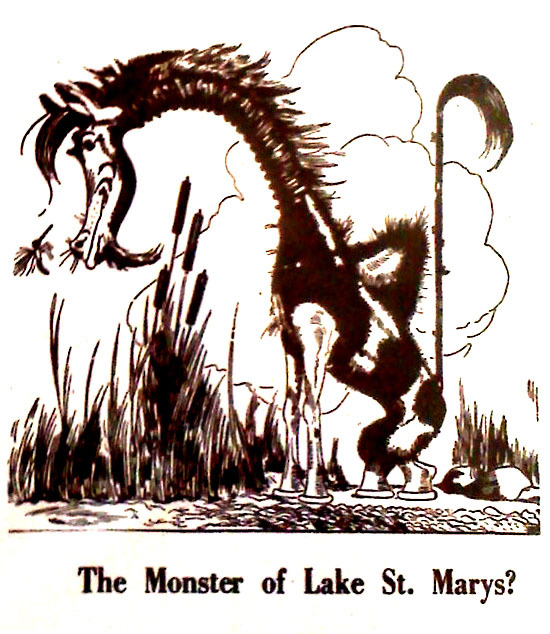 For decades the local lake community has battled over the official name of Grand Lake St. Marys – so much so that The Evening Leader even once threatened to sue The Daily Standard over the matter! A war of words. The lake has been called Lake Mercer, Lake St. Marys, Mercer Reservoir, Grand Reservoir, Grand Lake, Lake Celina, and, of course, Grand Lake St. Marys. The original name? The lake was originally called Lake Mercer, or the Mercer Reservoir. At that time Auglaize County (on the east side of the lake today) did not exist. St. Marys was in Mercer County, and served as the County Seat. In 1848, Auglaize County was carved out of Mercer and Allen counties. And the winner is… The argument was so famous that Ohio Magazine even ran a feature about it, titled “A Lake Divided.” After decades of debate, the moniker Grand Lake St. Marys was officially recognized by the U.S. Geographic Survey and the State of Ohio. Visit our Grand Lake St. Marys History Photo Gallery! What does it look like? The beast was said to be the target of many fruitless hunting expeditions, and is 3/4 the size of an elephant, posseses a serpentine body with a back hump, chicken-like feet, a green eye on the forehead and a red eye on the long tail, and is covered with hair and feathers. Learn more about the Hoedag in our photo gallery! Locals V. The State. When the lake was being dug, many on the north and south sides who had given up their land for it claimed they had not been compensated by the state. What’s more, residents on the west side complained that overflowed water, which stood at a few inches deep, would bring disease. Four days later, the group made a cut into the west bank to drain the water. The act resulted in 34 arrests, including those of the county officers, sheriff, judges, clerks, auditor, treasurer, recorder, surveyor, farmers, merchants, and private citizens. Despite the fact that the damage cost the state more than $17,000 to repair, the Grand Jury refused to indict those arrested and the matter was settled. The lake has also served as a natural wildlife habitat, and is on the major migration routes of several migratory birds and even Monarch butterflies. The waters are home to crappie, bass, bluegill, walley, catfish and perch. Grand Lake St. Marys is for flora and fauna, tourists and business, boaters and hunters/fishers, and lovers, friends, and family. But Ohio’s Great Lake is also threatened, and the safety, welfare, and economic stability of the lake community are jeopardized. 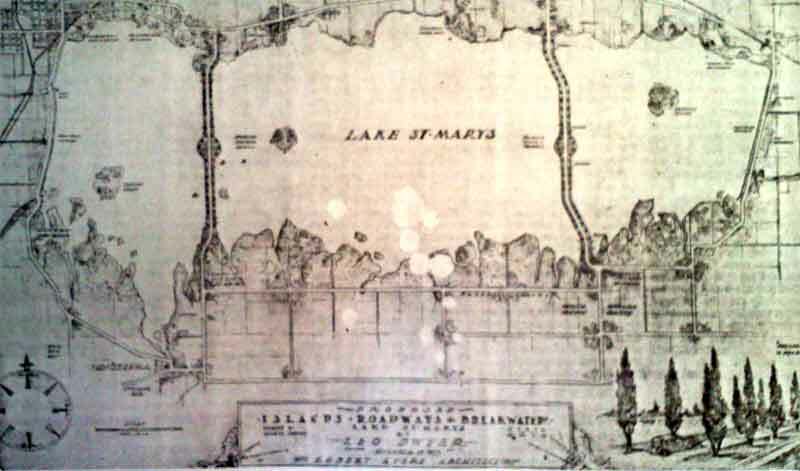 Today we have touched on the rich and fascinating history of Grand Lake St. Marys. Over the following weeks we will take a close look at the factors that threaten to destroy the lake and what needs to be done to prevent it.